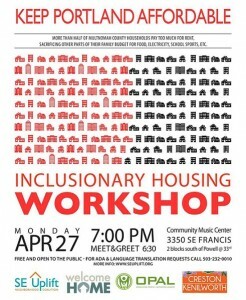 On Monday, April 27th SE Uplift, OPAL Environmental Justice Oregon and Welcome Home Coalition invited Portland residents to come out and learn about House Bill 2564 and what they can do advocate for local housing development policies aimed at creating and maintaining neighborhoods with mixed income levels. If you were unable to attend the workshop, you can watch all of the presentations via the videos below. Be informed: Don’t forget to sign-up for our speakers’ newsletters at: Welcome Home Coalition and OPAL, and to visit N&NE Neighbors for Housing Affordability’s Facebook page. Show up to advocate: Welcome Home just unveiled its new one-stop-shop calendar of all upcoming events related to housing advocacy – pick a date and add your voice to the action! •Save the date! June 4 Expo on Living Options for Growth in Neighborhoods, 6-9p, 5626 NE Alameda off of Sandy Blvd. We would like to thank everyone who attended the workshop, all of the organizations and individuals who are working to address housing affordability, and our amazing speakers: Vivian Satterfield, Cameron Herrington, Jes Larson, and Tamara Lynne. Thank you also to Hoda’s, Por Que No, and Petite Provence on Division for donating delicious food for the event.